We've lost the great Adam West, who played Batman on the iconic ABC television series from 1966-68. Mr. West helped popularize the title character and gave millions of non-comic book readers their first introduction to the Caped Crusader. In some ways he was to Batman what Sir Roger Moore was to Bond--charming, suave, and famously self-deprecating. Like Sir Roger with Bond, Mr. West was a wonderful ambassador to the Batman franchise and appeared on nearly every single Batman animated series from the '90s and '00s--his voice was unmistakable. It's sad losing two legends in such a short time. May they both fend off bad guys with aerosol cans in the afterlife. Absolutely. It's been a tough year for lovers of escapist entertainment, which Roger and Adam were giants of. I take comfort in the fact Adam saw the official Blu-ray release of the Batman TV show, along with a resurgence of the brand via comics, animated movies and various other merchandise. I take comfort in the fact Adam saw the official Blu-ray release of the Batman TV show, along with a resurgence of the brand via comics, animated movies and various other merchandise. There was also a sequel to last year's "Return of the Caped Crusaders" planned, with William Shatner as the voice of Two-Face. I hope Mr. West completed his voice work before he passed. And if you've never read DC Comics' "Batman '66" title, I highly recommend it. It's a loving and faithful expansion of the West Bat-verse, featuring popular villains who never appeared in the show itself or were introduced years after it went off-air. 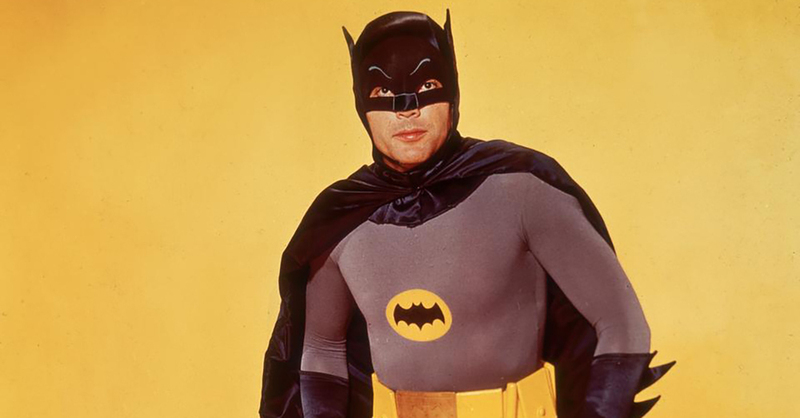 LIke most of us born in the 50s-70s, Adam West's Batman TV show was my introduction to the character and comics. While the later films derided the TV series as goofy camp, it did a remarkable job of introducing us, and faithfully I daresay, to its colorful villains. Cesar Romero's Joker, Meredith Burgess' Penguin, Frank Gorshin's Riddler, and Julie Newmar's Catwoman were so iconic that the first film representations of these characters sometimes faltered in comparison. His allies too, from Yvonne Craig's Batgirl to Burt Ward's difficult to update to modern times Robin, to say nothing of Commissioner Gordon, are all indelibly imprinted on our minds as iconic. The Batmobile and Batcave became lexicons of the culture if not forerunners to the modern "Mancave." West's portrayal of Batman was similar to how Sir Roger portrayed Bond, winking to the audience that this was, at the end of the day, fun. Like Star Trek's TV actors, West ended up on the convention circuit to make ends meet, a notion hilariously sent up on an episode of The Big Bang Theory where he agrees to be paid to attend Sheldon's birthday party provided he's given transportation to and from the event. Near the end, Seth McFarland cast him for as Mayor Adam West where his voice work, honed behind the mask all those decades ago, continued to entertain and bring smiles to us all. Apparently he finished his voiceover work on the film, which is a happy relief. And if you've never read DC Comics' "Batman '66" title, I highly recommend it. I enjoyed the B66 comic. It more or less captured the spirit of the TV show, even though the larger scale plots wouldn't have been filmed due to budget constraints. But that's a moot point. The writers were working within a different medium and played up to that. I was sad when the main series came to an end, but it had a good run. Generally speaking, I have a lot of time for West’s Batman. He's very faithful to the comics of the time - and he didn’t realise he was funny. Obviously the actor Adam West did, but the character he was playing saw himself as a deadly serious crime fighter. That's what made the performance so great. I'll always hold him in high esteem. RIP. A big part of my childhood.